Now that Martin Jones, Tyler Toffoli, and Linden Vey have become NHL players, it’s time for Kings fans to become familiar with the next wave of prospects in the organization. One name you can expect to hear quite a bit over the next six months is Michael Mersch. 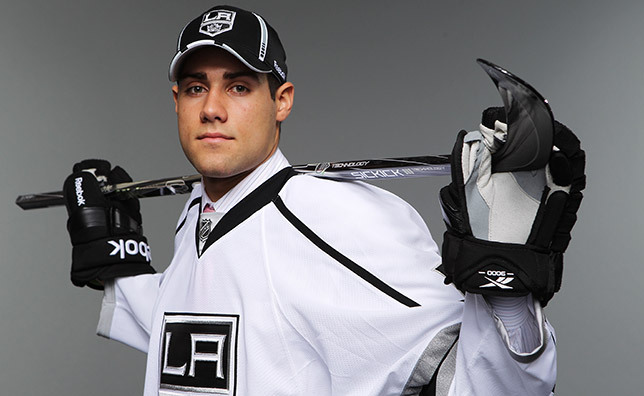 A forward, originally drafted by L.A. in the fourth round in 2011, he recently signed a three-year entry level contract and made his pro debut with the Manchester Monarchs on Friday night. Although he played at the University of Wisconsin for the last four years – where former King Gary Shuchuk is an assistant coach – Mersch isn’t entirely unfamiliar with several of his new AHL teammates. Throughout his collegiate career he played against Derek Forbort and Nick Shore. They were also his teammates during his time with the U.S. National Development Program in Ann Arbor, MI back in 2010. Time is something he’ll have a lot of in the weeks ahead. The AHL usually only plays on weekends, similar to his college schedule. However, rather than classes, homework, and professors during the week, Mersch now begins the professional development part of his career. This is when he’ll be hitting the gym and developing a routine built around enhancing his skills on the ice and properly conditioning his body when he’s not wearing skates, as well. Known primarily as a goal scorer, Mersch was nearly a point-per-game player over the last three years. This season, with 35 points in 37 games (22 goals, 13 assists), he was named to the first-team All-Big Ten after tying for first in goals and fifth in points. Perhaps the most impressive stat though is that he never missed a game at Wisconsin, playing 157 straight games for the Badgers. Now, Mersch turns his attention to improving his skating, among other things, where the Kings believe he can gain a half to full step moving forward. Right now, it’s his life that is in transition, not just the action on the ice. In less than a week he went from being a student-athlete and taking part in the college hockey playoffs to signing a pro contract and living in a hotel in Manchester. He certainly built plenty of memories over his four years at the legendary campus in Madison, yet a few of the big ones naturally rise to the surface when reflecting back – like the WCHA Championship they won his junior year. Maturation also took place along the way, although Mersch’s growth as a player is still a work in progress. Drafted as a left wing, Mersch has played both sides. Of course, he’ll play wherever the team wants him – and whichever position gives him the best shot at someday making the NHL. Yet, there are the natural preferences for one side over the other. Putting any positional question to rest for the short term, Emerson was clear when asked about how Mersch will be used during the initial part of his pro career. After his pro debut on Friday, Monarchs coach Mark Morris had a few encouraging words regarding what Mersch was able to offer the team. Whatever the future holds for Mersch, his eyes are wide open and he’s looking forward to things slowly starting to settle down in the days ahead. Put him on the ice though and Mersch is bound to find the back of the net. Then, for this promising young prospect, life becomes normal once again.